Michelle Obama greeted the crowd at a stop at the Forum in Inglewood, Calif.
Michelle Obama is not on just any book tour. When the former first lady comes to TD Garden on Saturday, about 20,000 seats in the arena will be filled. You can bet the energy will rival that of a Celtics game. Moderators on the 10-city promo tour include Oprah Winfrey, Tracee Ellis Ross, and Sarah Jessica Parker. In Boston, we’ll see her in conversation with The Race Card Project’s Michele Norris. When former president Barack Obama strutted on stage to surprise his wife Saturday night in Washington, D.C., he noted the similarities to their favorite hip-hop couple. The comparison is real. Beyoncé sells out arenas and counts Hollywood stars as fans. Obama does the same and counts Beyoncé as one of her biggest fans, too. And like Beyoncé, she’s a smart businesswoman, too. Queen Bey’s “Lemonade” stirred 787,000 viewers when it debuted on HBO in 2016. Obama’s book sold more than 725,000 copies the first day out and 1.4 million in the first week. According to Barnes & Noble, it is the fastest-selling book of the year. Beyoncé and Jay-Z’s “On the Run II” tour finished this summer with $253.5 million. Obama nearly sold out this tour two months ago — and did so largely within the first hour of sales. To score a ticket at TD Garden at this point is going to cost fans at least $495 — resellers came to get paid. The tickets started as low as $29.50 and climbed as high as $3,000 for special meet-and-greet VIP packages. There’s a three-part tour playlist. Curated by Questlove of The Roots, the songs are on Spotify and Pandora. Haters fall back, because it seems there’s no stopping Obama. She’s on the cover of Elle and Essence, and she just rolled out a collection of merch — from $10 bookmarks to $65 hoodies — that readers can get online or on tour. If you’re a member of the Beyhive, the font on the shirts, hats, and mugs is strikingly familiar. Obama, like Queen Bey, is a brand. The fever for the former first lady isn’t rooted in politics alone. 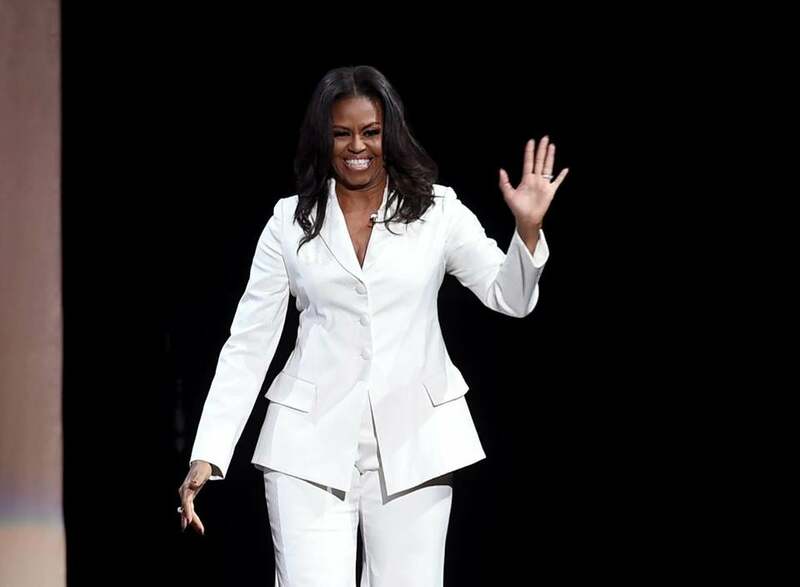 It’s rooted in the magic of Michelle — her style, wit, honesty, and grace. Fans want her advice on love, work, school, family, and the art of getting by and looking fly. We see ourselves in her. Alicia Keys and Gabrielle Union are among the many stars raving about “Becoming,” making #IAmBecoming a thing. Michelle Obama is a star. And some people are big, big mad. Just like when CNN’s Jake Tapper had a problem with the Obamas dancing at a Beyoncé and Jay-Z concert in July, there’s backlash to her booming pockets. “Michelle Obama has revealed herself as just another guru for sale,” New York Post columnist Maureen Callahan wrote before making the case that Obama’s working-class childhood should mean everyone gets an affordable ticket. How dare Obama do what celebrities have done? She was poor once. She should know better than to make money. Or a seat at the table. Part of the reason she wrote this book is to disrupt the narrative. But because she was a first lady, she’s expected not to get paid. Get in formation and stop this foolery unless we’re applying that same energy to everyone. The way this country works, you either look like a girl who didn’t struggle in that jacket and coat (word to Alexandria Ocasio-Cortez), or you’re shamed for being a former first lady making the same money that athletes, singers, actors, and entertainers make. Catch-22 much? Take it in: In a sale-rack suit, Ocasio-Cortez was accused of looking too rich to talk economic injustice. Apparently, there is a poverty uniform. But if you grew up poor and made it like Obama — even if you donate to charity and pour money into developing young people and community work — you are accused of selling out. Policing the purses and joy of black and brown people has got to stop. Yes, Obama is making millions of dollars. Just like Beyoncé. The thing is, for as much money as Obama is making, she’s giving gobs of it away, too. All net proceeds of her merch go to Global Girls Alliance’s education initiatives. Ten percent of tickets at each tour stop are being donated to local schools, charities, and community organizations. And those recipients will attend for free. According to her publisher, Penguin Random House, a chunk of her book proceeds are going to charity, too. Obama lived in the White House for eight years and feared for her children’s lives because birther conspiracists like Trump brought out extremists — which she writes about in “Becoming.” She and her husband were debased in that racist New Yorker cover in 2008. And she’s been called a monkey by politicians more than once. She gave us her all and so much of her family, too. She’s not a “guru for sale.” She’s a woman at work. As the first lady in 2015, Obama was asked: If you had the opportunity to have a different occupation, what would it be? In many ways, she’s living that pop star life. But Obama doesn’t need to wear Queen Bey’s crown. Lady Michelle holds a court that’s all her own.